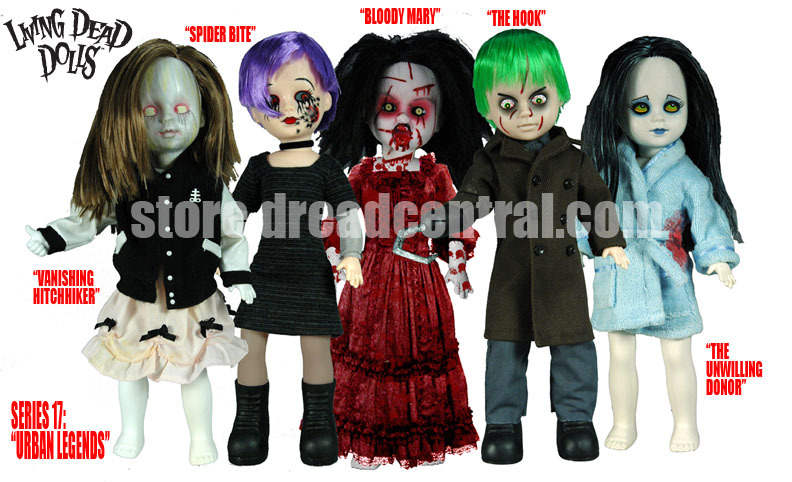 Dread Central has the first look at Series 17 of the ever popular Living Dead Dolls. This series is known as Urban Legends. The dolls are scheduled to be available in April 2009. Parked on a dark road, a bulletin comes over the radio that a criminally insane patient has escaped the asylum. What is that scratching on the car door? Could it be the escaped lunatic? He comes complete with removable hook. He found her alone on a desolate road on a dark night, he offered a ride. The next day, he remembers he left his jacket with her. He returns to retrieve it only to find, did she really exist in the first place? Complete with letterman jacket. Waking up dazed and in a bathtub filled with ice, what’s that crudely stitched up wound on her side and note by the phone? She has become THE UNWILLING DONOR, complete with kidney. Only the brave or foolish would dare to stand in front of a mirror in a darkened room and call her name thirteen times. Once summoned, her price must be paid…in blood! She comes complete with mirror accessory.